Its been a week for Jack Johnson, in 6 days he will have gone from playing in the NCAA Tournment to suiting up for his first NHL game. A trip that will take him from Ann Arbor to Los ANgeles with a lay over in Denver. After argeeing to a deal with the Kings on Monfay he spent Tuesday working out with some players on injured reserve, today was full practice with the team and his childhood hockey idol Rob Blake. While Anze Kopitar has become a foundation for the team at the center position, Dean Lombardi has been singing the praised of Johnson since he was aquired looking to him to be the cornerstone of the team on the blue line for better part of the next two decades. 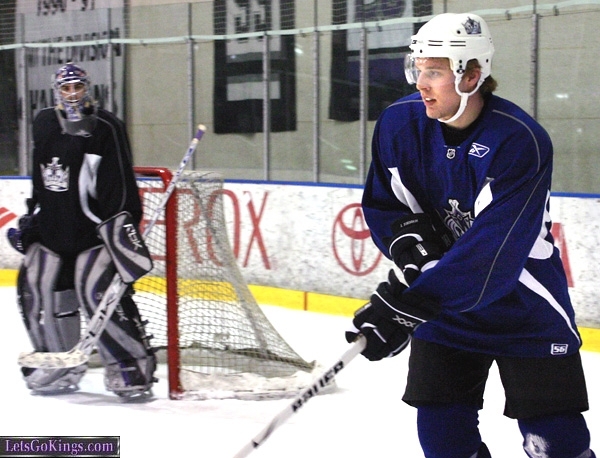 By Johnson jumping right into the NHL, it gives the Kings a glimpse at where his development stands to this point. The season is already a loss for the team but getting Johnson NHL experience will help in the creation of a development plan over the summer, acclimates him to NHL life and will shape the off-season aquisitions the Kigns will make with their anticipated $15-$17m in cap space this off-season. This move alone may end up selling out the last two home games fo the season because it sure won’t be playoff excitement. I of course will be at the game, because I am pretty much always there.